database: text from the database is displayed repeatedly on the sim at different places (shared media textures, the colored letters in the basement, the black letters at level 1, the white letters at level 2, etc.). the database now gets text from the text generator and stores it. the red letters distributed by Imaginary Difference also originate in the database. text generator: the text generator sends text directly to the sim via email and now also to the database. 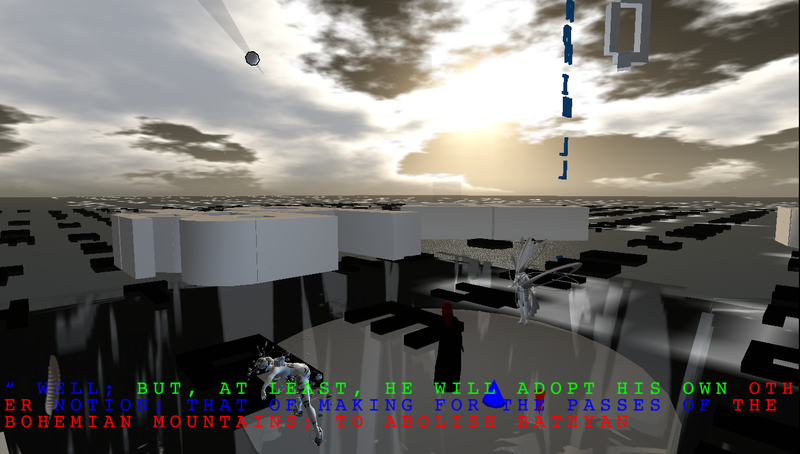 the text which is sent directly to the sim is told by Allegory Ordinary via chat, and generates the output of the letter fountain at level 3.
pandora bot: the bot Category Silent is connected to a pandora bot and responds to the sentences chatted by Allegory Ordinary. IMs to the bots: some of the bots will forward IMs to the database. we decided to switch off this feature, but might use it to do a real-time session with several people contributing text. the most convenient way to do so would be a group chat session (as i discovered by accident), which would then be sent by one of the bots to the database. since i don’t know yet whether the planned SMS feature will work, the HUD currently displays the raw output of the text generator. the HUD is displayed in the picture, i’ve sent this one to jerry roi!